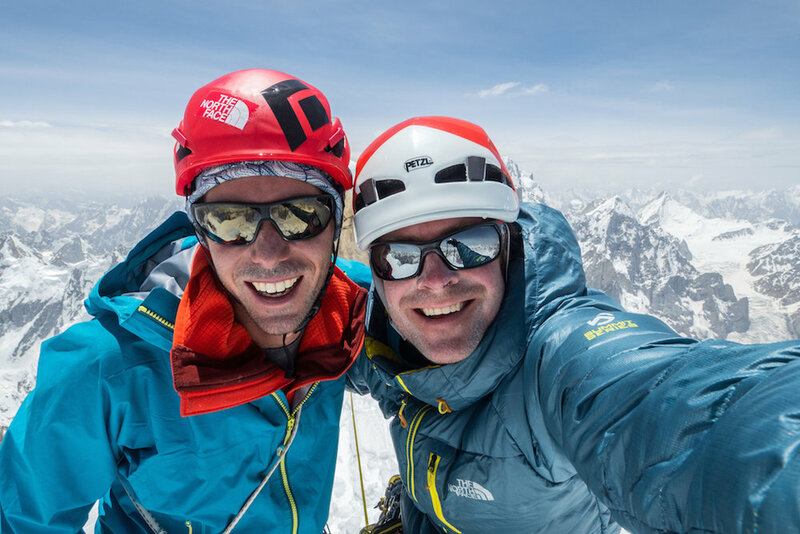 British climbers Andy Houseman and Jonathan Griffith made first successful ascent of Link Sar west summit 6938 meters on July 17th. They named the route ‘Fever Pitch.’ It was Jon’s fourth consecutive year on Link Sar. 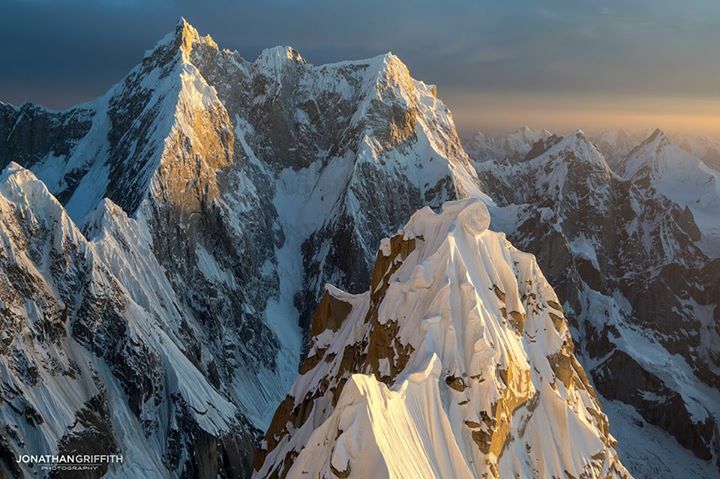 Main summit of Link Sar ‘7041 meters’ is still unclimbed, the mountain lies in Charakusa Valley, Pakistan Karakorum Range. All faces of Link Sar are constantly steep; there are pitches of rock, mixed climbing and black ice. Though its not the technicality of mountain which kept all summits out of reach so far, its the corniced ridges and routes which add incalculable risk on all possible routes. Link Sar. 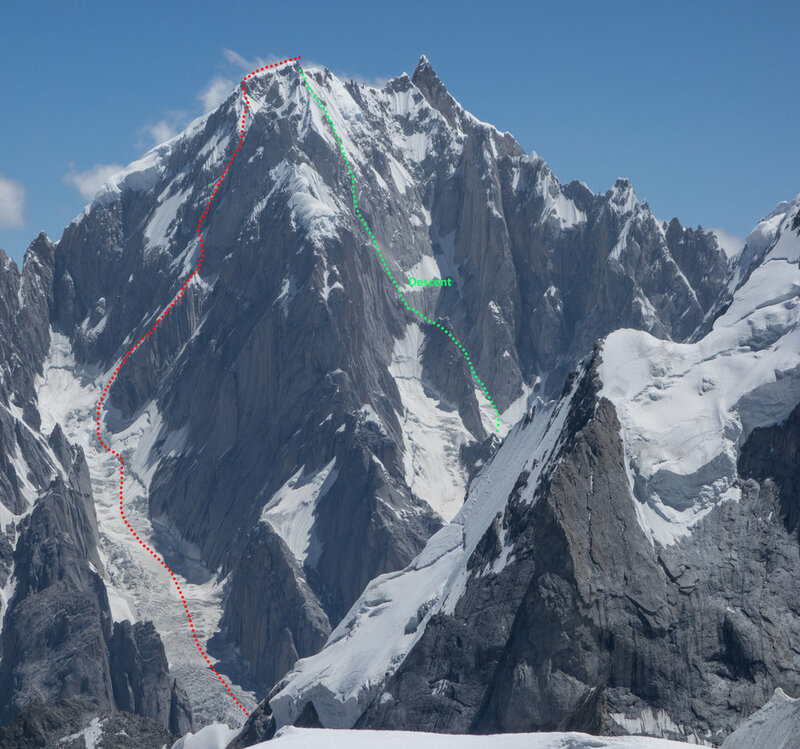 Red Line shows ascent route (named Fever Pitch) and Green line is Descent route. 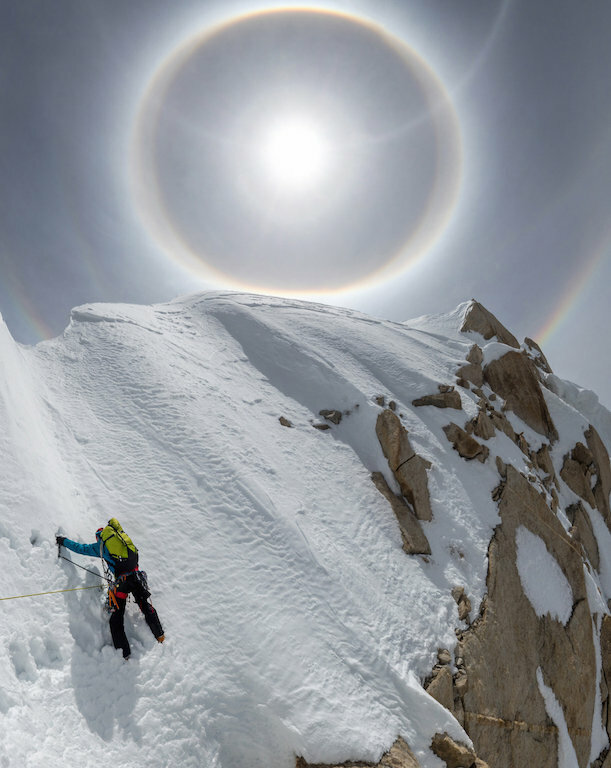 Jon Griffith and Andy Houseman acclimatized on Sulu peak, then they made seven days push to ascend and descend the west summit of Link Sar. They started from base camp on July 12 with expectation of reaching the foot of face the same day, deep snow made their journey long and hectic and it took them two days to reach the foot of route where they made first bivouac at 6100 meters. The weather was clear next day but they decided to stay put and let mountain dump soft snow from the face. The next day on July 15th they started push and after seventeen hours of climbing they topped out on corniced Northwest ridge of Link Sar where they bivouacked (6800m), this year they topped out further up on the ridge as compare to last year. Jon caught fever after climbing all day under sharp Karakorum sun, they wanted to wait another day for summit push and stayed put in second bivouac at 6800 meters. July 17th finally was the day they finally started summit push from ridge and reached the west summit 6938 meters around mid day, the plan was to attach main summit but they were out of summit window, food and Jon’s fever was coming back so they were forced to abandon the idea of main summit. They bivouacked near west summit and next day started descend, around 5 pm July 18th they reached base camp. First attempt on Link Sar was made by a Japanese team around mid 1980s via East face; Japanese team was able to make progress up to 6000 meters. The second attempt on the mountain was made by American team in 2001, they conducted reconnaissance on Japanese route and a possible route on the left of Japanese route, both routes were found way too dangerous, there was incalculable risk due to hanging seracs and corniced ridges. American team attempted a route on right of Japanese route without any success. Serious attempt on mountain was not made until 2012. 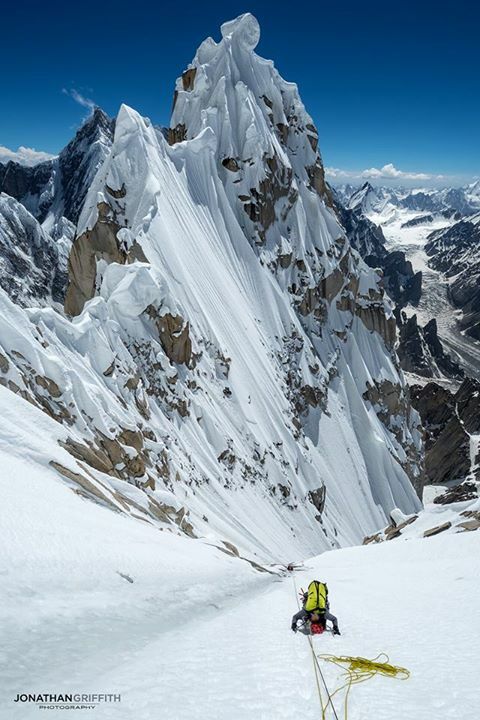 Jon Griffith teamed up with Will Sim in 2012 and decided to give it a shot, Link Sar was first time attempted from Charakusa valley by this team, and they attempted North-West face but could not make significant progress due to bottomless and unconsolidated snow. Another attempt the very next year was made by Jon Griffith and Andy Houseman, but this time again they suffered from altitude sickness and bad weather. Kevin Mahoney signed up with Jon Griffith in 2014 for third consecutive attempt by Jon, they topped out the ridge but could not make any further progress due to bottomless and unconsolidated snow on top of ridge. The fourth attempt of Jon again this year with Andy Houseman and they finally climbed West summit of Link Sar. Jon Griffith on Link Sar West summit.